Chelsea's Frank Lampard has become the third midfielder to withdraw from the England squad for Wednesday's friendly against the Netherlands. The 33-year-old didn't train with the team on Monday morning after complaining of a throat infection. When the midfielder felt no better in the afternoon, he was sent back to Chelsea for further treatment. Jack Wilshere and Michael Carrick had already withdrawn, prompting Manchester United's Tom Cleverley to be called up. 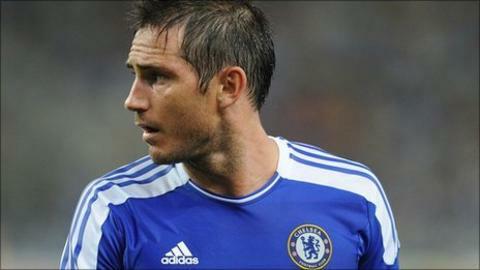 Lampard's absence increases Cleverley's chances of getting a debut England cap. Cleverley, 21, who came on as a substitute during United's 3-2 Community Shield victory over Manchester City on Sunday, has spent most of his United career out on loan, first at Leicester, then at Watford and last season at Wigan. The 21-year-old played for England at Under-20 level before making his Under-21 debut against Macedonia in 2009. United and England team-mate Ashley Young believes the midfielder is an exciting prospect. "Tom has done terrific all pre-season," said Young. "I am sure he will go on to be a top player." Tottenham defender Kyle Walker is also hoping to make his debut at Wembley on Wednesday in the absence of the injured Glen Johnson. Should Kyle Walker make his England debut on Wednesday it will be a game he will never forget. I spoke with him in the summer in Denmark when he was playing for the Under-21s as he was described as the "new Roberto Carlos". But when he talked to the media on a much larger scale on Monday, he stressed the importance of taking small steps to improve his game. He is an unassuming character and this promises to be a significant season for him. The 21-year-old played for the Under-21s against Spain at the European Championship finals earlier this summer and last month signed a new five-year contract at the White Hart Lane club after spending time on loan at Aston Villa. "It should be a special occasion in anyone's career to play for your country," said Walker. "Who wouldn't be excited? It's what I dreamed of since I started playing football, to play for England, and hopefully it comes." "The Tottenham contract I'm happy for, and hopefully I can get into the team now and push forward there. "There are a lot of quality players at Tottenham and it is going to be difficult. But it is massively important for me to be playing week in and week out."